Sotheby’s Arts of the Islamic World auction on 19 October 2016 will present rare and exquisite objects that tell the story of over a thousand years of artistic exchange and influence in the Islamic world. This October’s sale will open with a selection of fifty manuscripts and calligraphies from the renowned collection of the late Jafar Ghazi. Each of these works bears witness to the high esteem in which calligraphy was held in Turkey, the Middle East and Persia from the medieval period up until the end of the Ottoman era. 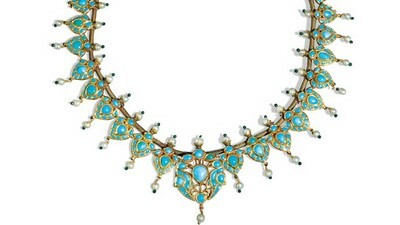 Further highlights include a beautiful turquoise-set and enamelled necklace from North India, known as ‘The Palmerston Necklace’, exemplifying the high quality craftsmanship of Indian jewellers in the nineteenth century; a silver-inlaid tray stand from Mamluk Egypt typifying the calligraphic monumentality so favoured by high-ranking Mamluk patrons and a rare painting depicting the Ottoman Sultan Bayezid I by the school of Veronese, circa 1580. Arts of the Islamic World is one of four sales this October celebrating interwoven artistic traditions Art of the Middle East and India. The week of exhibitions and auctions will also include the bi-annual sale of 20th Century Art: Middle East, Modern & Contemporary South Asian Art and the prestigious Khosrovani-Diba Collection, which comprises a selection of important Indian miniature paintings. Sultan Bayezid I (r.1389-1402), also known as Yildirım ('The Thunderbolt'), was the fourth ruler of the Ottoman Empire. During his reign, he expanded his empire into the Balkans and Anatolia, defeating a Christian army to secure his position in the region. His attempt to further increase Ottoman prestige by engaging in the Battle of Ankara led to his demise following his defeat in 1402 at the hands of Timur’s forces. 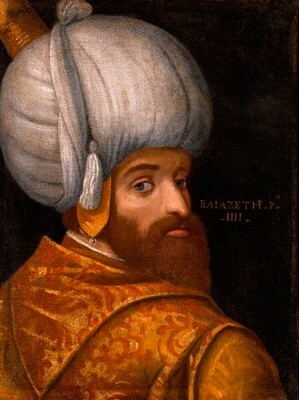 This portrait of the Sultan, depicted in three-quarter view looking over his shoulder and wearing a large turban and richly embroidered cloak, was directly influenced by a painting of Paolo Veronese’s portrait of Sultan Bayezid housed in the Collection Bayerische Staatsgemäldesammlungen, Munich. The discovery of the present painting is important as it re-emphasises the significance of Veronese’s original series of fourteen portraits of Ottoman Sultans, all now in Munich, which inspired the creation of at least three, if not more, subsequent sets which were painted between the late sixteenth to nineteenth century. The sale will open with a selection of fifty manuscripts and calligraphies from the well-known collection of the late Jafar Ghazi. Each of these works bears witness to the high esteem in which calligraphy was held in Turkey, the Middle East and Persia from the medieval period up until the end of the Ottoman era. A highlight of this group is a superb Timurid manuscript of Sa’adi’s Kulliyat, in almost pristine condition, complete with fine, crisp illumination and tooled and filigree-work binding. The manuscript includes Sa’adi’s entire work with the addition of the preface by ‘Ali ibn Bistun. 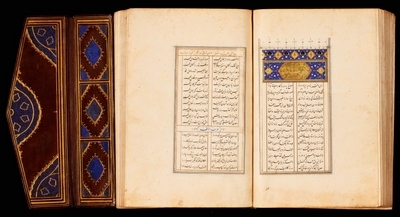 Na’im al-Din, who worked in Shiraz, copied different parts of the Kulliyyat at different times and that it took him at least nine years to complete this manuscript. 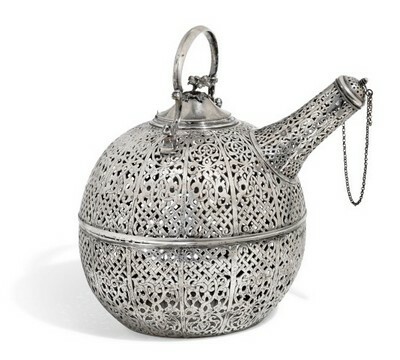 This rare silver cooling vessel or karlik was produced during the reign of Abdülhamid II (r.1876–1909), the last Ottoman sultan to exert effective authority before the rise of the Young Turk revolutionaries. Only a handful of these silver cooling vessels survive, of which this particular karlik is unique in containing a glass cooling vessel within the silver exterior. Liquid was kept cool by means of snow contained in a small compartment of the glass vessel. The presence of this glass vessel gave the Ottoman craftsman more freedom in the design of the silver exterior, allowing him to create an intricate pierced floral pattern, another feature unique to this karlik. The Nasrid Dynasty ruled Granada and the territory of al-Andalus for over two hundred years and oversaw a splendid artistic patronage that is still hugely admired today. Expanding on a tradition inherited from the Almohad dynasty of North Africa, the Nasrids developed a sophisticated visual language based on complex geometric designs. Designed with curving legs and armrests, this imposing chair derives its shape from ancient Roman 'Sella Curulis', throne-like seats reserved for government dignitaries, which spread to the Near and Middle East. The technique used to decorate these chairs, including the present example, is typically Nasrid, and is exemplary of the luxurious micromosaic furniture that flourished in Granada at the time. 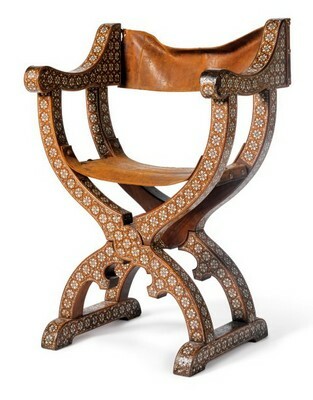 Chairs from the Nasrid period are extremely rare, particularly as their popularity meant that they continued to be copied into the nineteenth century. The Metropolitan Museum of Art holds six examples in its collection, all attributed to circa 1500, and each with a repeat ivory-inset design of geometric stellar compositions . When Andalusian historian Ibn Khaldun first arrived in Cairo, the capital city of the Mamluks, in 1382 AD, he described the city as ‘the centre of the universe and the garden of the world’. Not only were the monumental mosques and palaces impressive architecturally, but they also housed vast collections of wealthy and generous patrons. 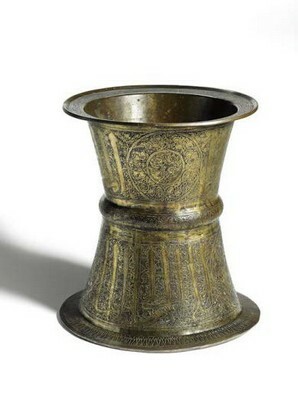 A brass tray stand with silver-inlaid decoration from Mamluk Egypt typifies the calligraphic monumentality so favoured by high-ranking Mamluk patrons. This likely belonged to a highly placed official at the Mamluk court – its beautiful thuluth inscription heaping praise on its patron - and is one of a few dozen that have survived to the present day. Its form and design proved so popular that porcelain imitations have been found as far afield as China, made perhaps to evoke the splendour of the distant Mamluk court. Further examples are in the British Museum, London, the Victoria and Albert Museum, London, the Museum of Islamic Art, Doha and the Metropolitan Museum of Art, New York. 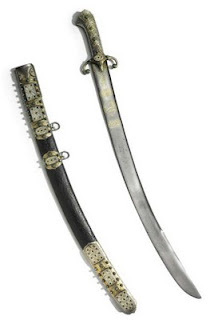 This exquisite karabela, Ottoman-made for a Polish audience, is a unique illustration of the fascinating szlachta culture that straddled East and West and drew from the rich artistic traditions of both. A richly-decorated ceremonial Karabela was a highly-treasured gift among members of the Polish nobility or szlachta. The prestige of the weapon was closely tied to the culture and ideology of Sarmatism, which held that the people of the Polish-Lithuanian Commonwealth were descended from the ancient people who inhabited the steppes north of the Black Sea in Roman times. Many members of the szlachta considered the Ottoman Turks and Crimean Tatars, also of nomadic descent, their peers, even if they were bitter enemies on the battlefield. Thus their arms and armour were modelled on the curved swords and scale armour of the Turks. This example hails from the collection of Karel Javůrek (1815 – 1909), a known academic painter from Poland. Sumptuous yet restrained in colour and design, this necklace exemplifies the elegance of nineteenth-century Indian jewellery. Passed down since the nineteenth century through the Cecil family, this necklace is referred to as the ‘Palmerston' necklace as according to family oral tradition it was gifted by the 3rd Viscount Palmerston (1784-1865) to an ancestor in the nineteenth century. Mounted entirely with turquoise stones within gold settings, the underside of this necklace reveals rich green, red and white enamel tones and detailed floral motifs typical of Mughal ornamentation. The turquoise itself most probably came from a Persian mine, and it is extremely rare to see it used exclusively on Indian jewels, who usually favour colourful combinations of stones. This may be an indication of the influence of English taste in the Subcontinent and was possibly originally created as a private commission. Suleyma Uskudari (d.circa 1686) studied under Mehmed Efendi of Belgrade, and went on to teach calligraphy at the Topkapi Palace. 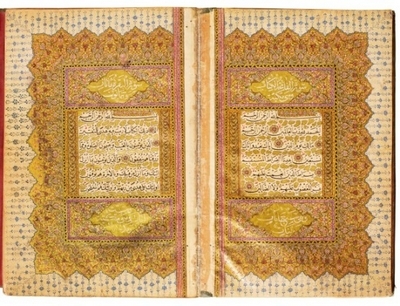 A further Qur'an, written a year earlier than the present example, is in the Museum of Turkish and Islamic Arts, Istanbul. 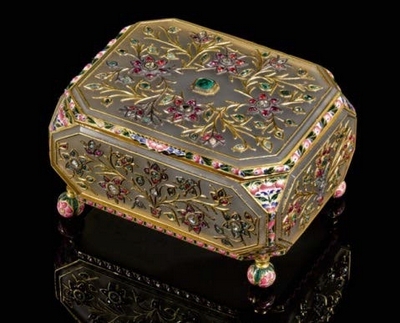 Exemplifying the high quality craftsmanship hailing from India, this opulent box combines the inclusion of colourful gemstones set into floral patterns using fine gold wires. The technique for juxtaposing semiprecious stones into others, such as agate, reached its zenith under Mughal rule and this trend continued into the 19th-century.